On Saturday, September 22, 2007 I departed Durango, Colorado. My destination was Moab, Utah, via Ouray and Grand Junction, Colorado. When I arrived in Silverton, Colorado it was still summer, but only for a few more hours. With an elevation of 9300 feet, autumn color comes early to Silverton. After only a brief stop in Silverton, I headed up and over the Million Dollar Highway. Built before the turn of the 20th Century, it is reputed to have cost one million dollars to build. For the traveler, its name might also apply to its “million-dollar views”. 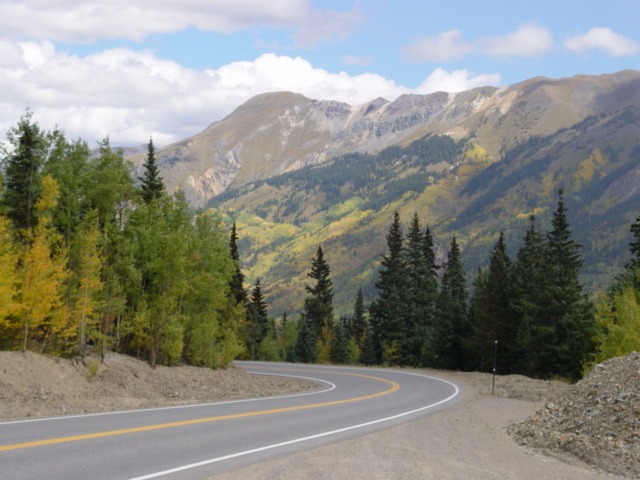 At the other end of the Million Dollar Highway is Ouray, Colorado, also known as the “Switzerland of America”. Ouray is at at a lower elevation than Silverton, but still gets a nice dusting of snow during the winter months. Winter or summer, the high peaks surrounding the town make it a dramatic place to visit. Its history is rich with mining and ranching. If you like expensive home sites, come to Ouray. After stopping for lunch in Ouray, I headed north to Grand Junction, via Montrose, Colorado. If you desire a place to do business that has all of the civic amenities, plus every big-box and chain store imaginable, I suggest a visit to Montrose, Colorado. It is on the Western Slope of the Rockies and is not subject to quite the weather extremes that some of the higher elevations must endure.